Alligation : It is the rule that enables us to find the ration in which two or more ingredients at the given price must be mixed to produce a mixture of a desired price . 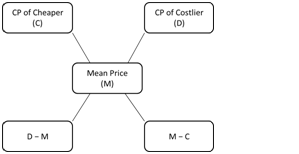 Mean Price (M) : The cost price of a unit quantity of the mixture is called the mean price. Example 1 : In what ratio must rice at Rs 9.30 per kg be mixed with rice at Rs 10.80 per kg so that the mixture be worth Rs 10 per kg ? Example 2 : In what ratio must a person mix three kinds of wheat costing him Rs 1.20, Rs 1.44 and Rs 1.74 per Kg so that the mixture may be worth Rs 1.41 per Kg? Solution 2 : This is also solved using rule of alligation but it involves concept of ratio and proportion too. Since there are more than two kinds of wheat present here , we need to find the ratio between pairs separately. Assume CP of 1st kind (Rs 1.20 per kg ) as I , CP of 2nd kind (Rs 1.44 per kg ) as II per kg and CP of 3rd kind (Rs 1.74 per kg ) as III. Example 3 : A painter mixes blue paint with white paint so that the mixture contains 10% blue paint. In a mixture of 40 liters paint how many liters of blue paint should be added so that the mixture contains 20% of blue paint ? Solution 3 : This problem is also solved using rule of alligation but there is also a direct formula to get the answer. The above problem suits to the direct formula number 4 given above. Example 4 : A milk vendor has 2 cans of milk .The first contains 25% water and the rest milk. The second contains 50% water. How much milk should he mix from each of the container so as to get 12 liters of milk such that the ratio of water to milk is 3:5? Thus x + x = 12 liters => x = 6 liters. There 6 liters of milk to be added from both the containers to get 12 liters of milk in the resultant mixture. Example 5 : A can contains a mixture of two liquids A and B in the ratio 7:5 . When 9 liters of mixture are drawn off and the can is filled with B, the ratio of A and B becomes 7:9. How many liters of liquid A was contained by the can initially ? Example 6 : The milk and water in two vessels A and B are in the ratio 4 : 3 and 2 : 3 respectively. In what ratio, the liquids in both the vessels be mixed to obtain a new mixture in vessel C containing half milk and half water ? Example 7 : A and B are two alloys of gold and copper prepared by mixing metals in the ratio 7 : 2 and 7 : 11 respectively. If equal quantities of the alloys are melted to form a third alloy C, the ratio of gold and copper in C will be ? It is not correct solution.